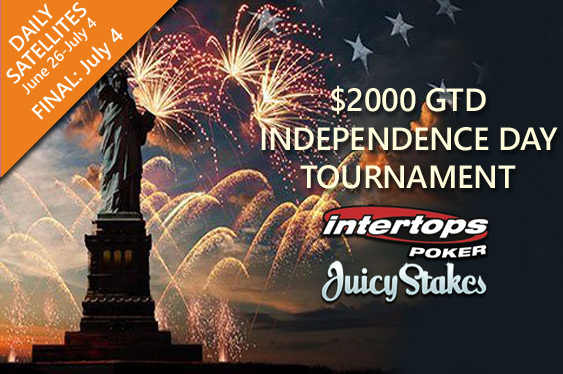 Daily $3 satellites for the July 4th $2000 GTD Independence Day tournament at Intertops and Juicy Stakes begin June 26th. “Independence Day is one of the biggest celebration days of the year in the US,” Intertops Poker’s manager said. “In amongst the fireworks, parades, barbecues, carnivals, fairs, picnics, concerts, baseball games and family reunions, we will be running our fantastic satellite poker tournament. Plenty of fireworks are expected in the ‘$2000 GTD Independence Day satellite’ events which run from June 26 to July 4 at 7:05am, 2:05pm and 7:05pm EDT. Buy-in for just $3, plus an entry fee of 30¢. The winner will be guaranteed a place in the grand final on July 4. If you don't qualify through the first parade of events you can also try your luck in two ‘$2000 GTD Independence Day LAST CHANCE’ events on July 4. These events will take place at 11:10am and 3:10pm EDT, with buy-ins priced at 90¢ plus an entry fee of 9¢. If you're confident enough to head straight to where the main action is you can buy a ticket directly for the ‘$2000 GTD Independence Day FINAL’ at 7pm EDT on July 4th. Final tickets cost $35 plus and entry fee of $3.50, with the overall winner set to experience an Independence Day they will never forget by taking away the grand prize of $2,000.